Greenpeace activists board Gazprom’s ‘Prirazlomnaya’ Arctic oil platform in the Pechora Sea on Wednesday. Russian coast guards have arrested two Greenpeace activists who scaled an oil platform owned by state energy giant Gazprom in the Arctic to protest oil drilling in defiance of warning shots, the environmental group and officials said. 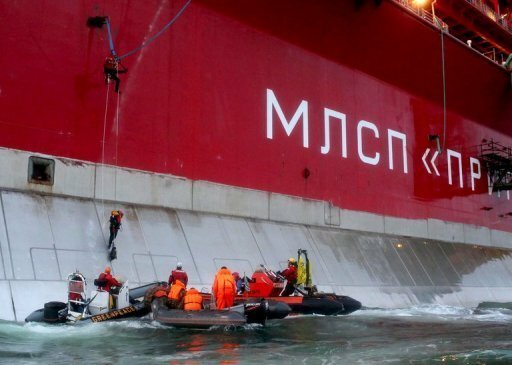 MOSCOW (AFP) – (AFP) – Russian coastguards on Wednesday arrested two Greenpeace activists who scaled an oil platform owned by state energy giant Gazprom in the Arctic to protest oil drilling in defiance of warning shots, the environmental group and officials said. The activists set off before dawn in inflatables launched by Greenpeace mothership the Arctic Sunrise and headed towards Gazprom’s Prirazlomnaya oil rig in the Pechora Sea, Greenpeace said in a statement. After leaving the inflatables, two activists were able to attach themselves to the platform with ropes, defying freezing cold water hosed down on them from the platform. However the two activists who climbed up the platform were arrested and taken into custody on board the coastguard vessel, Greenpeace said. Earlier reports said two others in the inflatables were also arrested but Greenpeace made clear the two climbers were the only ones detained. Greenpeace said that the coastguards fired 11 warning shots across the Arctic Sunrise but said the vessel would remain in the area. It condemned a “disproportionate” use of force in response to a “peaceful protest”. Russian’s Federal Security Service confirmed in a statement that its coastguards had fired warning shots from an AK-74 Kalashnikov assault rifle in response to the refusal of the ecologists to halt their “illegal activities” despite verbal warnings. It confirmed that two activists had been detained and said their identities still had to be confirmed. The FSB said it had also ordered the Arctic Sunrise to come to a halt and the coastguards had fired another four artillery shots but the vessel had refused to stop. Greenpeace said the two arrested were Finnish and Swiss nationals and one may have sustained a non-serious hand injury. Greenpeace said the coastguards had asked to board the Arctic Sunrise but were denied permission by the ship’s captain. “We are discussing the current situation and status of our activists with the coastguard and they have not yet boarded our ship,” said Ben Ayliffe, head of Greenpeace International’s Arctic oil campaign. “Employing this level of force against a peaceful protest ship is completely disproportionate and should stop immediately,” he added. The environmental group had staged a similar action led by its Executive Director Kumi Naidoo against the same oil rig in August 2012. Greenpeace said that Gazprom intends to start production from the Prirazlomnaya platform in 2014, raising the risk of an oil spill in an area with three nature reserves that is home to polar bears, walruses and rare seabirds. “This rusty oil platform is an Arctic disaster waiting to happen,” said Greenpeace activist Sini Saarela in a statement. The world’s largest gas firm, Gazprom has expanded its oil production operations in recent years and describes the Prirazlomnoye oil field as an essential element of its oil business development strategy. Russian and foreign environmentalists regularly accuse Gazprom and other big Russian energy firms of turning a blind eye to ecological concerns as they seek to find energy resources in ever more remote locations. However the Russian energy firms insist they fully adhere to environmental regulations during exploration and production operations. Gazprom declined to comment on the situation.